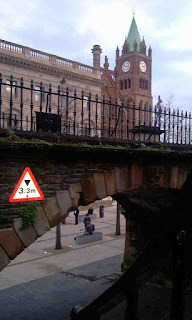 In this series, Post-2013, we take a critical look at the transitions that Derry~Londonderry and its people will undergo in preparation for the UK City of Culture 2013, and we speculate on the long-term cultural sustainability for the region beyond 2013. Series curated by Aimear Lynch. The newly constructed Peace Bridge connecting the Cityside and the Waterside. Photo by Aimear Lynch. The tension was palpable in the Guildhall Square as the winner of the UK City of Culture was revealed in July 2010. The announcement saw Derry~Londonderry beat off stiff competition from the other nominee cities (Birmingham, Norwich and Sheffield) to secure the cultural year. The award, a first of its kind within the UK, follows the success of Liverpool as European Capital of Culture 2008, and provides the city and region with a unique opportunity to showcase the its distinctive and diverse cultures. Securing the title has helped to focus attention towards the city with large scale national and international organisations considering hosting events in the city and region. The Turner Prize, Stirling Prize, BAFTAS, Brit Awards and the Clipper Race could all potentially be hosted within the city (Guardian, 16th July 2010). Just in the past few weeks it was announced that the Academy of Urbanism would host their Annual Congress in Derry in 2012. With such high profile events, attention will undoubtedly fall on the city. Belfast is still enjoying the surge of pride in the wake of the MTV European Music Awards which solidified the city’s image as a strong European city of culture. Derry is now poised to bask in the same level of attention with increased visitor numbers, revenue and hotel stays. With a wealth of cultural activity and the progression of the city and region’s regeneration plan (One Plan, 2011), the announcement was warmly welcomed by Derry City Council, ILEX and the people of the city. Since tourism and sustainable development were two key sectors for economic growth in the city’s regeneration plan, it was identified that economic regeneration could be catalysed by key cultural events and projects for economic and cultural stimulation. A key strategy of the lead organisations tasked with the development and delivery of the bid (ILEX, Derry City Council, Culture Company) is to deliver the cultural year through large scale highlight cultural events, such as the Peace One Day concert and the Turner Prize. These highlight events will then be supported with smaller, more local cultural events and activities promoting the city’s own culture. To see the current programme of events leading to 2013 click here. Recent rejuvenation of the public realm in the city centre, designed by BDP. Photo by Aimear Lynch. Another blow to the cultural year was the announcement that the upgrade of the Derry to Coleraine railway line would be delayed beyond 2013. The refurbishment of the line - once described by Michael Palin as one of the most beautiful rail journeys in the world - is now expected to be completed in 2016/17. This will no doubt be a disappointment for visitors during 2013 (BBC News, 18th August 2011). But in spite of the early setbacks, the most significant impact of being awarded the mantle of UK City of Culture will be the cultural legacy the event will leave behind. Long-term cultural sustainability will be the most significant asset the City of Culture will bring to the region. Undoubtedly increased revenue and exposure for the city from highlight events will have a positive influence but it is a short term solution for the city. A key consideration of the delivery organisations will be the long-term vision for the cultural sustainability of the city and region beyond 2013. Derry will be the primary precedent for future UK City of Culture award-winners and therefore should be prepared for significant future scrutiny. A strong cultural bid has secured the UK City of Culture for the North West but will the vision outlined in the bid document manifest in the coming years? Already we approach 2012 with significant steps still to take. In this blog series we'll follow developments to the built and cultural fabric of the city, and speak to key people in the process. 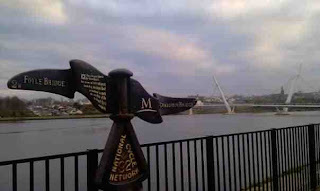 We'll ask: will Derry-Londonderry deliver when the spotlight focuses on the North West in 2013? And will the city continue to shine once the party is over?